Using this instead of flurry, its working out way better. 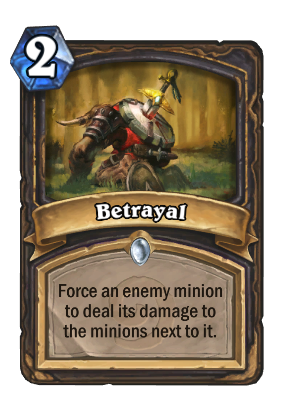 Good card, it can be very efficient, but is some cases when u are using this to get rid of two minions it means u are already behind on the board and still have to remove the minion u targeted. Cool card, I see some potential in constructed play eventually. It's a cool combo starter. In arena, it's very good. Some notes: It doesn't get buffed by spell damage. It also triggers after the trogg's effects. Let's say you cast Betrayal on a fresh Burly Rockjaw Trogg. It deals 5 damage, not 3. This seems like a really great card, why isn't it run more? An absolutely devastating card that has seen little to no play in the meta so far due to an overall lack of worthwhile targets. With the introduction of the Mech type in the GvG expansion, we're starting to see some rather threatening targets on board throughout the game as Mechs synergise very well together. For example, Shaman's Powermace provides a massive boost to their early and midgame minions such as Annoy-o-Tron Harvest Golem and, scarily, Arcane Nullifier X-21. Of course, you can't use this on the Arcane Nullifier but you can reach it if your opponent doesn't flank it appropriately. Vs Handlocks, Recombobulator Giants (Clockwork Giant)- Mountain Giant and Molten Giant are excellent targets for this. I've also seen Mages running Sea Giant which are also good targets. This card serves a unique role that no other class currently has access to - it works like a Shadow Madness with Windfury by giving you access to one of your opponent's minions for a turn. Given that board presence is not something that Rogue excels at compared to other classes, this is an incredibly powerful effect for 2 mana and its existence should force your opponent to play their minions in a particular order to avoid it. Combined with Sap and now the playable version of Assassinate in the form of Sabotage you can quite readily select your sabotage targets. This SHOULD be played with other cards, as a combo starter for Sabotage Eviscerate or Sap to get rid of the threat you are using because usually, the biggest threat on board will still survive. It also has quite possible the best Golden Card art - the tassel hanging off the pommel blowing in the wind is such a nice touch.